By chance, I spotted a tweet announcing an open day at Sutton Community Farm. 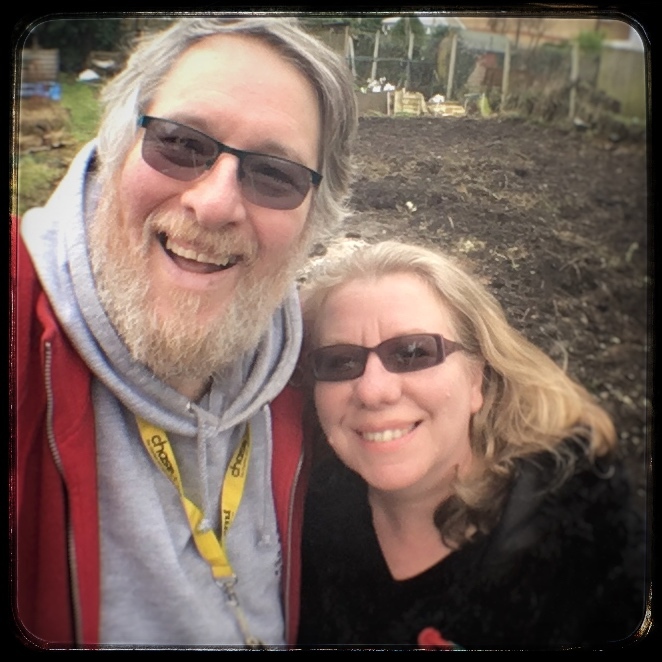 We thought this might provide a useful learning opportunity to help with the new allotment, and we wanted to check out what facilities they had. When it started snowing, we were a bit apprehensive but we decided not to let that put us off our visit. Despite the inclement weather, Joris Gunawardena, Farm Director and Head of Production, took us on a tour of the farm. We started in the polytunnels. In the first tunnel, Joris showed us their mushroom growing trial. Here he is with a crop of oyster mushrooms, which are grown in spent coffee grounds that come from Caffè Nero in Wallington. Mushroom growing is a new venture for the farm – they are trying to understand the process with a view to scaling it up. It was fascinating to see but a little beyond our Quest for Veg allotment plot capabilities (for now!). Using polytunnels allows them to extend their season. Joris told us that they can increase the yield of a tomato plant by 100 per cent. He also told us that they are the most productive community farm in London. Last year their yield was 17 tons of produce. Most of it goes to their veg box scheme although 25 per cent went to restaurants, and they are hoping to expand the restaurant side. Pak choi (below) is a good crop because it grows very fast. allowing them to harvest and replant in quick succession. Pak choi at various stags of growth because it has been harvested and replanted a bit at a time. A huge amount of what they grow is produced using Mypex. To stop it fraying, they use a blow torch to cut holes in the fabric where the plants are to grow and where they want to put the automatic watering system. Mypex is often used in organic systems as a weed control mechanism. It is something we are planning to use on our plot. Andrew is also planning an automatic watering system. So it was great to see both of these in action. Below you can see winter perslane on its second flush of leaves, having been harvested once. Winter perslane or miners’ lettuce (Claytonia) grown through a weed-suppressing membrane. Outside it was a bitterly cold day. Kale and the remains of a sprout harvest are kept under wraps to protect. Kale and sprouts under a protective cover. Despite the freezing temperatures and occasional snowflakes, a few brave souls worked to clear beds ready for the coming season. The farm relies on volunteer support. Between 50-80 people help out each week with everything from administration and veg box preparation to harvesting and site maintenance. They have a rigorous crop schedule so that everyone knows what jobs need to be done. Part of the crop schedule showing the plan for legumes, roots and green manure. The soil at Sutton Community Farm is sand over chalk meaning that it has a tendency to dry out. This can give them problems with crops such as garlic which need a good supply of water. So they grow it under a membrane to help keep moisture in and grow an early purple variety of garlic to increase their chance of success. An early variety of garlic grown using Mypex. The tour ended with a quick look at colourful raised herb beds. But, sadly, it really was too cold for us to linger too long. We’ll need to visit again in the warmer weather. We’d like to say a big thank you to Joris and the team for making us feel so welcome. A very cold cold frame.